John Faubion, a former missionary to Asia, has written a wonderful suspense story for his first published novel. 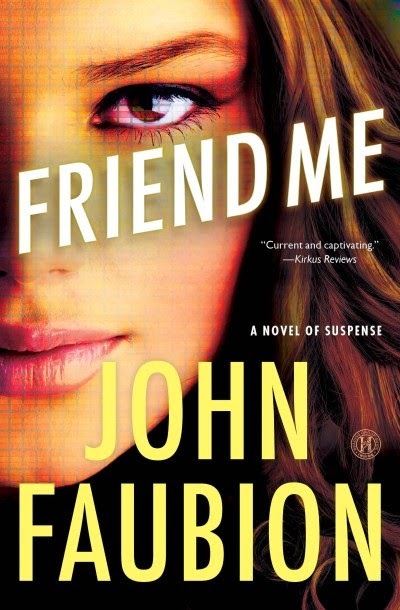 Friend Me is a story that reminded me of the 80’s suspense film, Fatal Attraction. Rachel and Scott Douglas are a Christian couple with two children living an ordinary middle-class American life in Indianapolis, Indiana. Out of boredom they both sign up with a company that offers a virtual friendship where they can design their own friend. Rachel designs her best friend, Suzanne who died a few years earlier. Scott designs a woman that he can talk to about problems with work and at home. From this point on the story takes off and does not let up until the end. Like a rollercoaster, Faubion’s story picks up speed, rushing to an ending that will surprise you. Early on there is a sense that something is going to go very wrong and that this will not end well. The suspense builds and builds to a crescendo and the ending did surprise me. There is definitely a sense of foreboding all through the book. Faubion has written an excellent suspense novel but he also explored the idea of how quickly an individual can be sucked into doing things they never dreamed they would do. The author looked at how a seemingly innocent act – signing up for a virtual friend – could escalate into a war between good and evil. Friend Me will not only keep you reading – it is a page-turner – but also offers much to think about in a time when social media is such a ubiquitous part of life. I recommend this book – especially for someone who enjoys being absorbed by a novel that demands to be read to the end. I received a copy of Friend Me from the publisher in exchange for a review. All opinions expressed are my own. When a lonely wife and her frustrated husband each secretly pursue companionship online, neither dreams that a real woman is behind their virtual creations, threatening their marriage---and their lives. Scott and Rachel's marriage is on the brink of disaster. Scott, a businessman with a high-pressure job, just wants Rachel to understand him and accept his flaws. Rachel is a lonely housewife, desperate for attention and friendship. So she decides to create a virtual friend online, unaware that Scott is doing the exact same thing. As Rachel desperately tries to re-create a friendship with a friend who has passed, Scott becomes unfaithful and is torn between the love for his wife and the perfection of his cyber-girlfriend. But neither realizes that there's a much larger problem looming . . . Behind both of their online creations is Melissa, a woman who is brilliant---and totally insane. Masquerading as both friend and lover, Melissa programmed a search parameter into the virtual friend software to find her perfect man, but along the way she forgot to specify his marriage status. And Scott is her ideal match. Now Melissa is determined to have it all---Scott, his family, and Rachel's life. As Melissa grows bolder and her online manipulations transition into the real world, Scott and Rachel figure out they are being played. Now it's a race against time as Scott and Rachel fight to save their marriage, and their lives, before it's too late. In today's digital age, the Internet presents all kinds of opportunities to test our personal boundaries, and this exciting and suspenseful story raises important questions about the ethics of virtual relationships. Friend Me will open your eyes to a new---and terrifying---moral dimensions and how they play out in the real world.